In the scope of machinery applications, Safety-related parts of control systems uses in most cases relays or contactor. These components have an "non safety" failure mode that is the sticking of contacts or of one contact that prevents others from opening contacts and prevents to place the machine in a safe state, eg a state without energy in order to supress the movements. The relays used in the safety machinery applications must comply with design requirements regarding their ability to not contact welding output.These relays are called "Relays with forcibly guided (mechanically linked) contacts" and comply with the requirements of EN 50205 standard. safety relays with non-overlapping contacts. This European Standard EN 50205 with the following title "Relays with forcibly guided (mechanically linked) contacts " specifies special requirements and tests for elementary relays with forcibly guided contacts, also known as mechanically linked contacts. These special requirements apply in addition to the general requirements of EN 61810-1, EN 61810-5, EN 116000-3 and EN 60255-23. EN 50205 is not applicable to electromechanical control circuit devices as described in other standards such as the following standards: IEC / EN 60947-5-1. The main requirement of this standard that is a "principle of safe design" is that an active contact (working contact) and a non-active contact (non-working contact) can be simultaneously closed. 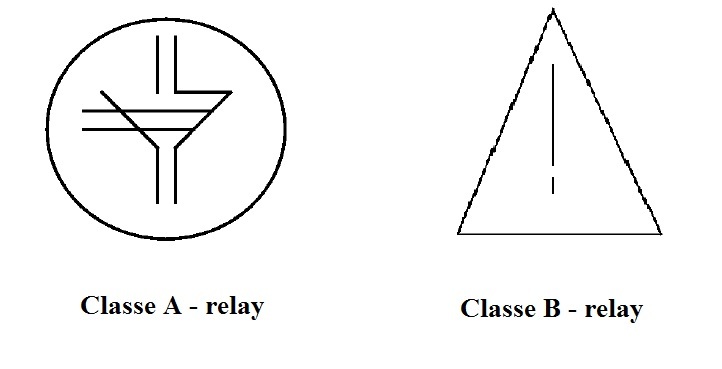 This imposes rules of construction of the safety relays. With respect to the diagram below, this means that a relay with mechanically linked contact must have at least one opening contact and at least one closing contact and that this closing contact includes mechanical measures that the opening contacts and the closing contacts ("non-working" contact and "working" contact) to be simultaneously closed. The relay has "working" contact) and "non-working" contact. In normal operation, the status of these contacts is complementary and reversed. In case of default, the defaulting working contact (Contact welded) prevents the non working contact to change of state. Thus by reading the state of the relay contacts, it is possible to know if a contact fails. 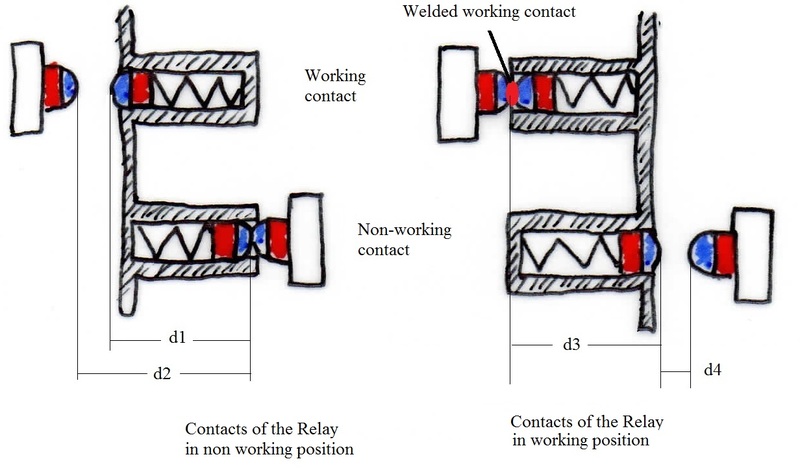 d4 = residual distance between the two parts of a set of contacts in the welding of a complementary contact. second condition: the distance between the contacts (d4) must be greater than 0.5 mm for simple contacts "at openning mode"
In addition, this type of relay must also have a certain level of reliability, since the standard specifies a minimum mechanical endurance of 107 cycles. 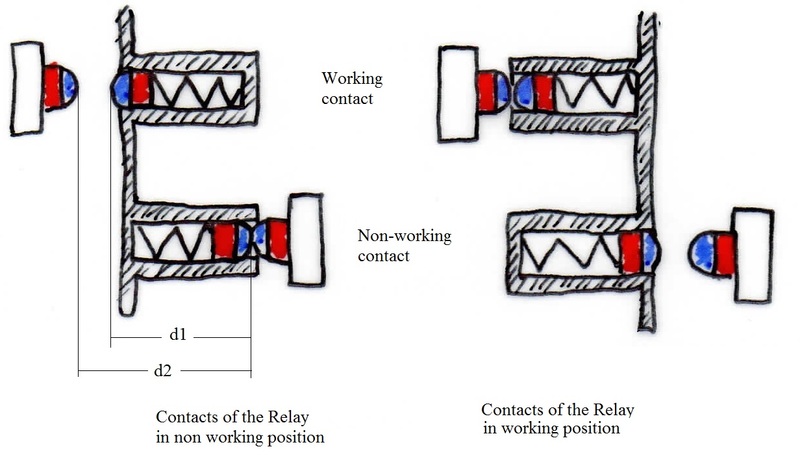 Class B were non mechanically linked contacts can be mixed on a relay with mechanically linked contacts .